A high school teacher recognized Abigail’s academic interests were beyond just mathematics and suggested she would thrive in the security field. When she was a junior at Northwestern, a CIA analyst talked with her about how valuable mathematics can be in the security and intelligence fields. After that, Abigail realized working for the government, seeking to prevent tragedies like 9/11, was something she could pursue. 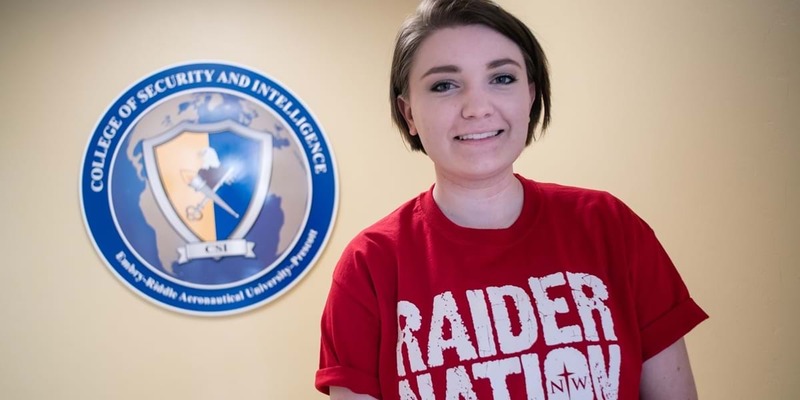 Since then, she dedicated every research paper and project she could toward developing her understanding of how she can use mathematics to help keep the U.S. safe. I was looking for a school that offered small class sizes, decent scholarships and a Christ-like atmosphere. I was also looking for a school that had an impressive mathematics department, and Northwestern’s actuarial science program drew me in. Northwestern checked all the boxes. What led you to major in mathematics? I excelled in math and I knew it was widely applicable, so it seemed like a good field to study. I loved how mathematics could be used to help describe this crazy, complex world in a logical, structured framework. I also saw mathematics as an outlet for my creativity, which I know is not a typical response to math, but it really is a creative discipline. It took me a while to figure out what I wanted to do with a degree in math, but I knew I loved it and that was enough for me. How well prepared have you felt for graduate school? So many of my peers have degrees in law, political science, criminology or history, and most of them also have professional backgrounds in the military. I was a math major. But the general education courses I took at Northwestern and many of my electives provided a solid foundation from which I could develop my understanding. I am so grateful for the political science, writing, sociology and psychology courses I took at Northwestern. Northwestern also prepared me for the rigors of a graduate education simply by being an institution with such high academic standards. Embry-Riddle is quite intense when it comes to academics, but I was already used to that. What did you appreciate about Northwestern’s faculty? I loved how available and involved the professors were. I miss that. Dr. Jongerius and Dr. Westenberg in the mathematics department made a significant impact on my life. They were always so encouraging, and when I told them about my crazy idea to go to grad school and study security and intelligence, they didn’t doubt me for a second. I cannot express how much that meant to me. There were so many other professors who made an impact on me as well. The professors at Embry-Riddle are amazing too, but I doubt I will ever get a Christmas card from them or grab a cup of coffee with them to just catch up on life. After talking to my peers at Embry-Riddle, I realize just how rare it was that I had professors who always had my back—who not only knew my name, but knew me personally. What are some of your favorite memories from your time at NWC? Any coffee date. Spontaneous trips to Perkins at 1 a.m. Midnight walks down Central Avenue with my roommates. Driving 50 minutes to get a cup of Starbucks coffee. Impromptu Walmart runs. P&W. The Doxology. My favorite memories are all those little things that made Northwestern my home for four years. How did you choose Embry-Riddle? Embry-Riddle’s Prescott campus has the only College of Security and Intelligence in the country, so that was a big factor. But even more than that, I felt star-struck with almost every single one of the professors. When I visited Embry-Riddle’s campus, the professors would stand in front of their students and say things like, “I need to check if this has been declassified before I continue” or “When I was in the CIA” or “When I was in the FBI.” For so much of my life, the security and intelligence fields seemed like the things of Hollywood, and yet here were real professionals who decided to spend their retirement teaching the next generation of professionals. I felt this was the place that would successfully prepare me for the realities of working in the U.S. intelligence community.